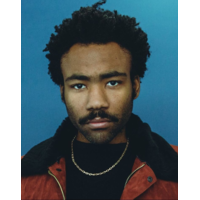 Donald McKinley Glover (born September 25, 1983) is an American actor, writer, comedian, musician, and rapper. Glover first came to attention for his work in the sketch group Derrick Comedy and is best known for his role as community college student Troy Barnes on the NBC comedy series Community. Contrary to a persistent rumor, he is not the son of Danny Glover. Glover was born on Edwards Air Force Base, California, and raised in Stone Mountain, Georgia, attending Rockbridge Elementary School and DeKalb School of the Arts. His Comedy Central special revealed that he was born into a foster home run by his mother. He graduated from New York University with a degree in Dramatic Writing in 2006.